Tried my first tomatillos a couple of days ago -- boy, I've been missing out! 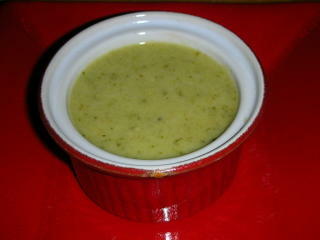 And so I had high hopes for this soup that combines poblano peppers, tomatillos and cucumber. But who knew that something with heat (from the jalapeno, not the poblanos, I think) could be bland, too? If it made up in 10 minutes, I might be inclined to adjust the flavors until they worked. But no, it took nearly an hour of active, hands-on cooking PLUS the chilling time. Still I'm anxious to keep going with tomatillos - they taste so fresh and bright. And if you're looking for a cold vegetable soup that IS good, try this carrot soup. Turn the broiler on high. Wash and halve the poblano peppers, removing the seeds and membrane (the membrane is where most of the heat from peppers resides). Flatten on a baking sheet and place under the broiler until blackened, about 10 minutes. Transfer peppers to a paper bag and close tightly to cool for about 10 minutes. Place a pepper on a cutting board, skin side down. Carefully insert a sharp knife between the skin and the flesh and peel away the skin. Repeat with the remaining peppers. Chop and set aside. Meanwhile, heat a large deep skillet or Dutch oven. Add the olive oil. (As it's heating, there's plenty of time to chop the onion and garlic.) When it's hot, add the onion and garlic and stir well to coat with fat, then saute about 5 minutes. (As they're sauteing, there's time to chop the tomatillos and cucumber.) Add the tomatillos and the cucumber, combining well. Cook for about 5 minutes. Add the broth and the chopped poblano peppers, cook for about 10 more minutes until tomatillos are tender. Add the jalapeno, lime juice and cilantro. Transfer in 3 or 4 batches to a blender and blend til smooth. (Caution: if you put too much of a hot liquid in a blender, the air pressure will blow the top off and will not only make a huge mess but will also risk burning anyone who's nearby.) Transfer to a large container with a cover. Stir in cream. Refrigerate for at least 3 hours (an hour in the freezer worked tonight, at least for the purpose of chilling, perhaps not for melding flavors) or overnight.